Bluetooth speakers come in all manner of sizes, shapes, colors and sound quality. So how do you choose which Bluetooth speaker makes sense for you? Much depends on where you'll be listening and how much you want to pay. My seven favorite Bluetooth speakers cover a wide range of listening environments and budgets. There's something for everyone. 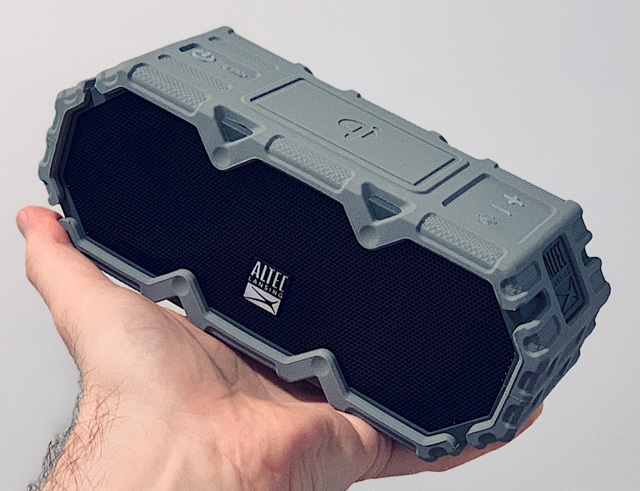 If money is an issue and portability only an occasional need, save yourself some shekels and opt instead for this nearly no-name Sbode M400 speaker. Since it's just a third of the price of the UE Boom 3 and the Altec Lansing LifeJacket Jolt, you obviously don’t get as much. For instance, the M400, which is essentially the same size as the Boom 3, only supplies 8 hours of music listening, a fraction of the Boom 3 or LifeJacket Jolt battery life. The M400 gives you IPX6 water-resistance instead of the Boom 3's and LifeJacket Jolt's IP67 waterproofing, which means the Sbode will withstand a spritzing (i.e. rinsing it off after touching it with messy hands in the kitchen or sand from the beach, for instance) but not a dunking. Both the LJJ and the Boom are, well, boomier and a produce a bit more volume, and you can't stand the M400 on one of its ends or you'll block one of its end woofers. But, the M400 includes two things the Boom and LifeJacket Jolt lack: an FM radio and a microSD card slot, which means you can listen to tunes even without a Bluetooth connection to a smartphone or computer. Plus, the M400's controls are easier to see and access along its side. 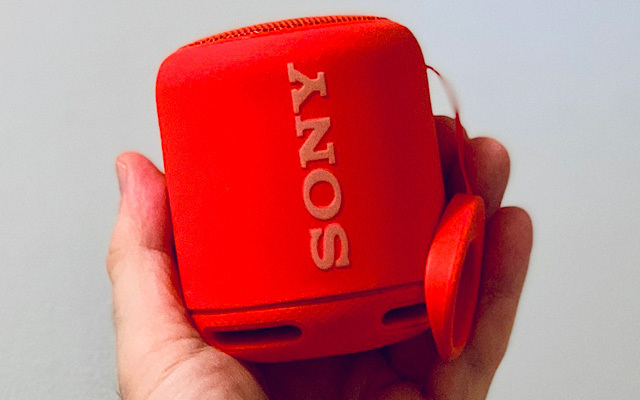 If portability and boomy bass are Bluetooth speaker requirements for you, try this stumpy Sony SRS-XB10. Since it's just 3.5 inches short and, at 9.17 ounces, weighs around a third less than the Boom 3, Sbode M400 or the Altec Lansing LifeJacket Jolt, the XB10 has become a permanent resident at the bottom of my backpack, ready to be reached for whenever I need it. Sound-wise, the XB10 is equipped with Sony's Extra Bass – its bottom is vented to produce boomier bass than you'd imagine possible from such a squat speaker, while producing an equally surprising ear-piercing yet distortion-free level of volume, enabling instant partying. Like many small speakers, it's mostly a muddy midrange mess. But there's thankfully no screeching distortion at top volume. 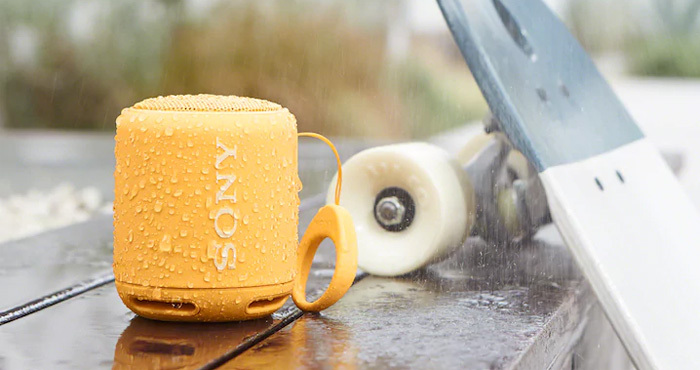 So, combined with its boomy bass, these attributes make the XB10 superior to most other pocketable speakers and certainly a preferable option to a naked smartphone for outdoor use. For convenience, XB10 is IPX5 rated so it'll survive some rain or beach spray. It'll play for a whopping 16 hours between charges – longer than most cheaper speakers in its general stubby size class. Its rubber ring lets you sling, slip or hang it from any outcropping such as bicycle handlebars or anywhere else out-of-the-way. And, you can create stereo with a second XB10. It's available in six bright hard-to-lose colors, and, if you have an Android phone, the XB10's NFC allows you to insta-tap-to-pair. 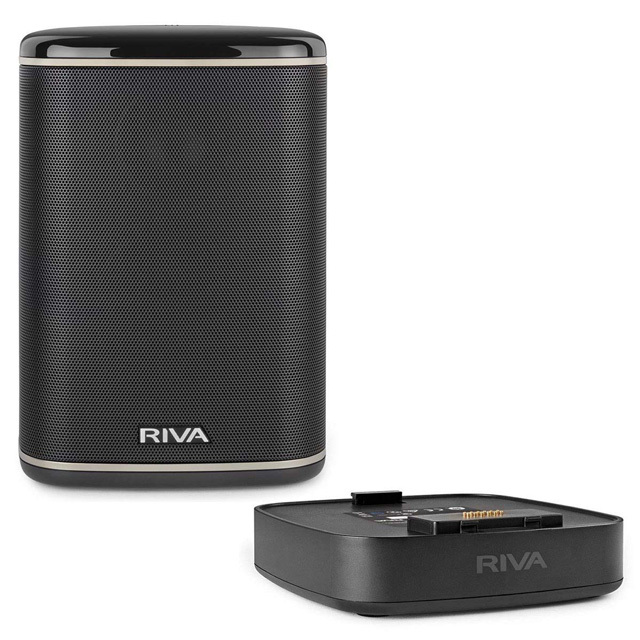 If you were to ask me who makes the best-sounding Bluetooth speakers, I wouldn't hesitate: It's Riva Audio. The sonic design of this company's Bluetooth speakers are overseen by its founder, a certifiable music legend – Rikki Farr, the British concert promoter who has presented some of the biggest acts in rock n' roll on stage including Jimi Hendrix, The Who, Tom Petty, Bob Marley and Led Zeppelin, for nearly a half-century. Bottom line: the man knows music, and has managed to transfer this knowledge and love of sound reproduction to his company's wireless speakers. The Concert, available white or silver, is a Sonos One-like Wi-Fi/Bluetooth/AirPlay/DLNA-connectable multiroom speaker imbued with Amazon Alexa, and a mic for Amazon Calling and Messaging for home intercom. Sonically, Concert outputs a hefty 50 watts, and the company's three-channel Trillium technology creates a stereo image from a single speaker rather the mono most other smart speakers of its type produces, so you don't need to buy a pair of them. The Concert includes improved transducers compared to earlier impressive Riva speakers, wider frequency range, lower distortion, improved audio tuning that includes a loudness compensation to keep all frequencies balanced at any volume, and more bass and treble extension. The subjective result: stunningly silky yet stalwart stereophonic sonics. Practically, unlike the Sonos One and other Wi-Fi/Bluetooth multiroom speakers, Concert can become portable thanks to an optional 20-hour Arena battery base ($49, check price on Amazon) that also can be used to recharge a smartphone or other music player, includes separate music and volume controls so you're not constantly adjusting the loudness and is splash-resistant so it's okay to bring to the beach or poolside as long it doesn't fall in. 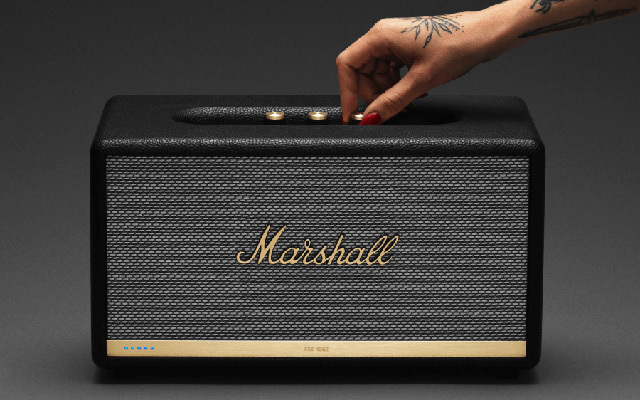 As soon as you see that familiar gold scripted Marshall logo, you know you're getting a solid stereo speaker that sounds as singularly cool as it looks – talk about your rock n' roll feng shui. But this latest Marshall Wi-Fi/Bluetooth speaker – which, unfortunately, does not go up to 11 – is not only Amazon Alexa-enabled, but also multiroom. You can set them up around your abode and ask Alexa to play Adele upstairs, The Beatles in the bedroom, Drake in the dining room, Carrie Underwood in the kitchen, or Logic in the living room. Up top are deliciously old-fashioned golden volume, treble and bass level knobs and an on/off toggle switch – no new-fangled touch controls, and a 3.5mm headphone jack to physically connect a music source. Sound-wise, Stanhope's powerful stereo sound with deep but even bass are pushed out by two 15-watt class D amplifiers and a 50-watt class D subwoofer amplifier. Far-field mics let the Stanmore II hear your Alexa commands from across the room. If Stanmore's 13.78 x 7.68 x 7.28 inch dimensions make it too large, or you want to add some less-pricey Marshall satellites, the Acton II Voice ($299, check price on Amazon) is a smaller, less-pricey alternative. There are a lot of "shower" speakers out there, but none match the sheer placement versatility – not to mention the aesthetic and acoustic quality – of this compact circular speaker. Sort of reminiscent of a round soap-on-a-rope, the best thing about the Clip is its namesake carabiner, which lets you hang it out-of-the way from a shower curtain ring rather than hogging valuable shelf real estate from your body wash, shampoo and conditioner containers. Plus, clipping Clip 3 to your curtain means it's not in-your-face like other spigot-hanging shower speakers. 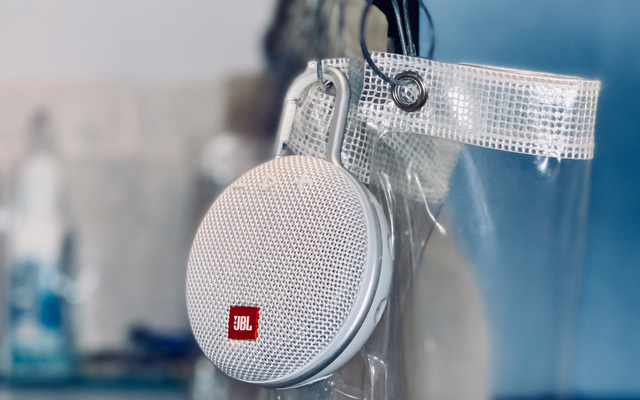 Clip 3 is plenty loud (remember to turn the volume up on your music source) to fill any stall, but JBL seems to have rightly boosted the vocal frequencies so vocals aren't drowned out by the high-pitched "shhhhh" of the shower spray or your off-key accompaniment. You get 10 hours of playtime, which works out to around a month of showers, depending on how long you like to liquid luxuriate (I just recharge it on the first of the month). Clip 3 is IPX7 waterproof, so submersion in a tub-full of soapy bathwater won't harm it. Clip 3 is available in 11 colors, including blue, red, teal, pink, yellow, green, and white, making it easy to match to your curtain couture. Many bikers and hikers riders eschew in-ear phones to keep their senses tuned to traffic, forest, or other potentially impactful ambient noises, so instead clip a Bluetooth speaker to their handlebars or belt to supply a soundtrack to their saunters. Then, to stay hydrated, riders and hikers also clip a water bottle to their down tube or backpack. While there are a surprising number of combo water bottles/Bluetooth speakers, I kinda like this new iHome model. 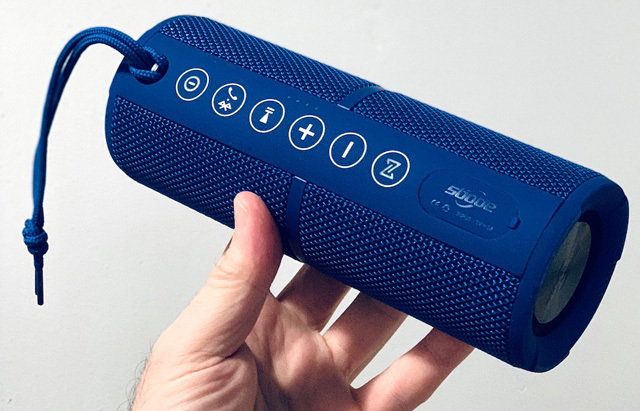 It's a bit less copious than its competitors – 16 ounces vs. the 20-plus ounces of many other Bluetooth bottles – and will play for the same 8 hours as others of its ilk. 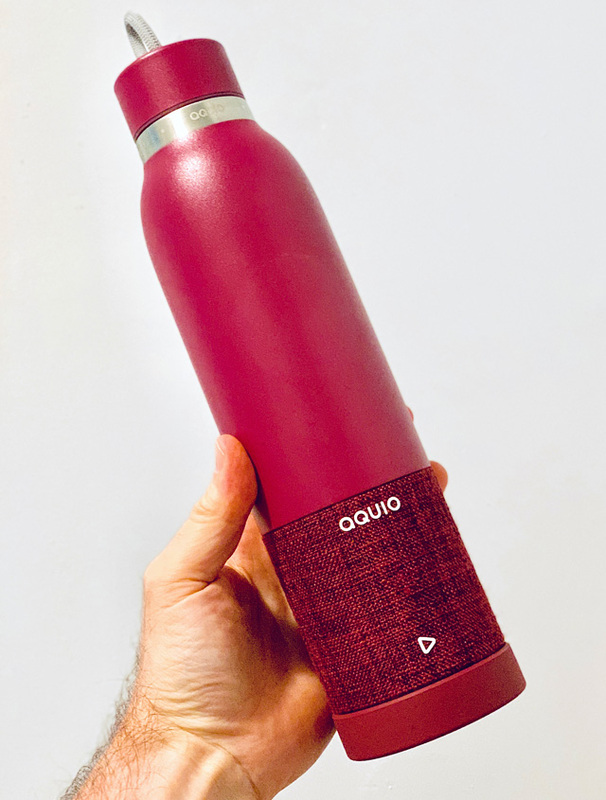 But Aquio is uniquely modular; its weather-proof IP67-protected cloth-covered speaker base easily screws off and its cap bottom screws back on to the bottom of the water bottle to create two separate items. Plus, the speaker doesn't make the bottle bottom-heavy – the combo is pretty well-balanced, so no worries about liquid suddenly gushing out when you tip it to your lips (although a spigot or tube top would have been preferable), and there's a cloth loop on the top so it can be hung. Sonically, the Aquio outputs 5 watts of smooth-sounding sound, although it could use a bit more exercise-inspiring bass. Aquio's double BPA-free walls will keep your Gatorade chilled for around 24 hours, and it's available in four fashionable colors: black, blush pink, merlot purple and seafoam green to match your tracksuit.